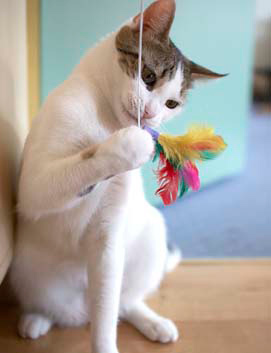 Newsletter from Mango: Cats Like to Play! Buddy did a great blog last month on how dogs can play with their Humans? Now it’s my turn to tell you how we cats like to play! My Human, Judi, told me recently that I’m becoming an “ole softy”. I’ve been living with her about a year now and I’m finding domesticated life much more to my liking. I still like to stalk critters from under the bushes in our front yard – but it is nice to have a safe, dry place to call home. And, speaking of rain, hasn’t it been WET out there! If you’re reading this from your up-North home, the dry spell is over. I had fun yesterday teasing the tadpoles that are growing in my neighbor’s driveway swale. We cats like about 10-15 minutes of game-time, maybe a couple times a day, preferably at dawn or dusk. (Mid-day is nap time.) And not for too long, but long enough that we can score a decisive victory over our toy. My favorites are toys that move like a mouse or bird; quick and unpredictable. I like bling-y toys: reflective and sparkly. Mouse-sized toys in different textures are popular! I don’t really care for toys that make noise, but some of my cat friends do. Why don’t you come to my Humans’ store, Cats n Dogs, to see all the new cool toys just for cats! Brands like GO CAT GO, From the Field, and others. I call myself lucky because my Human has given me a whole basket full of toys. I get bored if we play with the same ones all the time. Your Human doesn’t have to buy all your toys though. I put a link below to give you some ideas for homemade toys. A year ago, I wasn’t interested in playing with Judi. But she kept trying – well, “teaching” me how to play. Now I look forward to it! My friend Sandy, he loves to play Catch! 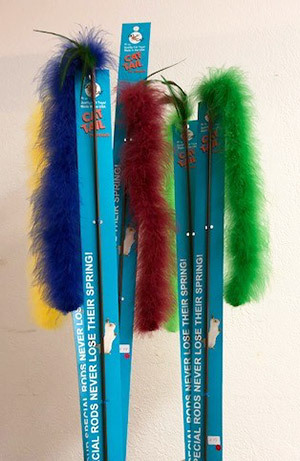 Catch – your Human should dangle and bounce a fabric creature, feathers or something shiny. We cats should try to catch it. NOTE to Humans: we cats like to WIN, so bounce the toy around, but let us catch it sometimes too. Hide – Haha – this game is like finding critters out in the bushes! Humans, move a toy on a string under a rug, bedspread or towel. Make it look like a mouse under there. POUNCE! Hunting – sophisticated cats don’t hunt for their food anymore, but that doesn’t mean we don’t play with it. Toys that release food are lots of fun. A food ball loaded with food that pops out when pushed around and pounced on is tons of fun! Fetch – isn’t just for dogs, cats enjoy it too (we’re better at it). Choose a toy that is easy to throw and then easy to carry. Chase – some of my cat friends like to try to catch a light bouncing on the ground. Chasing something you can’t catch can be frustrating though. Remember, we LIKE to win – and then it’s a fun game! Anything that shines or reflects light will work. But please don’t use a laser pointer! 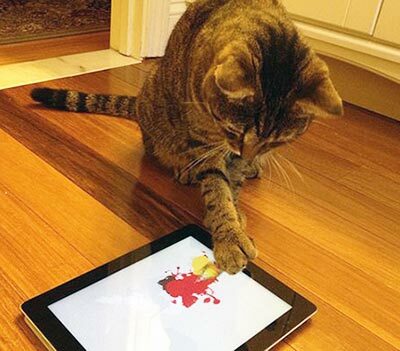 Digital – Modern Cats enjoy playing cat games on the tablet. There are all kinds of games with fish, mice and other movement that are very exciting. Have your Human do a Google search. Please keep your hands and arms out of the way so we don’t scratch you. It’s better not to make us jump for toys. Same safety reason. I do like my solitary time but sometimes I get bored. Especially with all the rainy days and not wanting to go out. I have a confession to make – I like to scratch! Those cardboard things are great. So are the tiered scratching posts. I can climb and hide and sit up high to watch what’s going on. You can get these at Cats n Dogs store. Some of my cat friends like to pounce in and out of a box, an empty paper bag or cat tent. I hear it is great exercise too. Your Human can play along by scratching or poking the paper bag. It’s a mystery who is on the other side. There are tons of other games and toys that cats like. Let us know what YOUR favorites are! Leave us a comment @catsndogspetstore on our Facebook.